I haven’t seen nearly as much as I would like of Lewis & Clark country in Washington and Oregon. But a couple of years back we got to do something really unique, traveling with a National Geographic tour along the Columbia and Snake rivers on their expedition boat Sea Lion. So while I still have a lot of ground to cover in that region, I treasure the memory of experiencing the land from Lewis & Clark’s river perspective. … little river in a Stard. bend, imediately below a long bad rapid in which the water is Confined in a Chanel of about 20 yards between rugid rocks for the distance of a mile and a half and a rapid rockey Chanel for 2 miles above. This must be a verry bad place in high water, here is great fishing place, the timbers of Several houses piled up, and a number of wholes of fish, and the bottom appears to have been made use of as a place of deposit for their fish for ages past, here two Indians from the upper foks over took us and continued on down on horse back. The captains found a large stream at the end of the rapids that they named Drewyer’s River after their indispensable hunter, George Drouillard (they invariably called him Drewyer). The name did not stick, and today it is known as the Palouse River after the Palus Indians who inhabited this area for thousands of years. They also gave their tribal name to the fast, agile horses they bred here, the Appaloosa. For us, the big event of the morning was kayaking! We rode up the river in Zodiacs to a weedy launching spot splendid with purple wildflowers. We claimed a two-person kayak and soon we were paddling calm and glassy waters through a beautiful canyon. (Because of damming the river is no longer wild and the rapids are submerged). We paddled beneath amazing tall cliffs, where we discovered some mud swallow nests on the cliff walls and saw a blue heron and a buck mule deer. The silence and serenity were something I will never forget. Of course we got tired, being more scholars than athletes, but I still wish this experience could have gone on forever. We made our way back to the launching spot at the appointed time and made a short trip back to the Sea Lion to change into dry clothes and grab our cameras. Then we Zodiac’d to shore again, this time to board a schoolbus to Palouse Falls State Park. 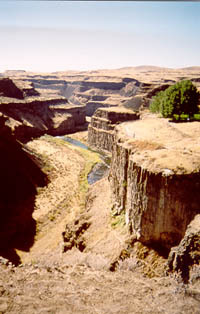 Palouse Falls is a beautiful 200-foot cascade that thunders over a towering, castle-like cliff face. Very nice–but the truly astonishing thing about the falls and the craggy canyons that surround it is how they were formed. Most of us are used to thinking of these kinds of formations being created over many millennia by the natural process of water acting on rock. But these falls stand instead as a remnant of unimaginable cataclysms that roared over this land in a matter of mere hours. It may seem impossible that a flood, no matter how massive, could shape the land for all time. But that’s exactly what happened during the event(s) known as the Bretz or Missoula floods. During the last Ice Age, ice blocked what is today the Clark Fork River in Idaho, creating a 2000-foot dam of ice. Just by way of contrast, the dam in the 1889 disaster in Johnstown, Pennsylvania was 72 feet; the Hoover Dam is 727 feet high. The river’s flow built up behind this dam, forming a gigantic lake that scientists refer to as Lake Missoula. Every so often, the ice dam would fail, unleashing the entire contents of the lake through the Columbia River Basin. These floods were of a force and scale never seen in modern times (fortunately) and not seen on such a scale anywhere else on the planet. A towering tsunami of water thundered out of the lake at some 65 miles per hour, scouring the land, stripping away everything in its path, and carving out spectacular canyons and coulees as it roared to the ocean. These events lasted about 48 hours, not thousands of years. And over the course of about 2500 years, they happened again and again and again, leaving behind a landscape of surreal and incredibly rugged beauty. The floods ended about 13,000 years ago. The Native Americans of the region have stories that indicate an ancestral memory or at least an understanding of what happened here, but it took a lot longer for modern geologists to accept it. In 1923, after studying this area for years, geologist J Harlen Bretz published a paper arguing that the formations he called “the channeled scablands” had been formed by cataclysmic flooding. For his efforts, Bretz was almost universally laughed out town by the geological establishment, most of whom had never visited this remote area. At this distance, it’s hard to determine whether Bretz’s greater sin was challenging prevailing orthodoxy, or his unconventional path to academe; the former schoolteacher could be blunt and abrasive, had worked his way through the University of Chicago, and was not a member of the Ivy League establishment. In 1927, Bretz was even invited to a conference in Washington, D.C. to present his ideas, then forced to sit there while speaker after speaker rose to debunk his claims. 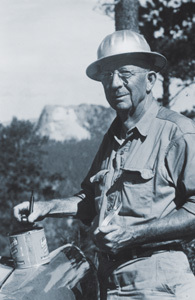 Apparently undaunted, he continued his research until his retirement in his late 70s; gradually, his ideas were not only accepted but enlarged upon by the work of other geologists. In 1965, a group of leading geologists touring the scablands during an irrigation project cabled the elderly professor: “Greetings and Salutations. We are all now catastrophists!” A few years later, pictures taken of the earth from space proved beyond the shadow of a doubt that the area was riven with channels that could only have been caused by massive flooding. In 1979, at age 96, Bretz was honored with the Penrose Medal, the highest honor bestowed by the Geological Society of America, for his immeasurable contributions to earth sciences. He quipped after the ceremony that his only regret was that “all my enemies are dead, so I have no one to gloat over.” I was interested to notice when I was looking around the internet for information about Bretz that he is a favorite of creationists. I’d love to know what he would have said about that! After visiting Palouse Falls, we went on an amazing (if very dry and dusty) hike and saw great views of the Falls, the Palouse River, and the stupendous canyons beyond. Here in this remote spot is something that rivals the Grand Canyon in magnificence. We also saw some B-52 fighter jets training overhead–also quite a thrill. Back on the Sea Lion, we enjoyed a fun BBQ lunch and then napped in our cabin for a while. Took in a Lewis and Clark history lecture and then just relaxed on deck, enjoying the fresh air, some interesting locking through the river’s dams, and a beautiful sunset. That is such beautiful country! Of course, I’m a little biased towards the Northwest. 🙂 I’d love to spend time up there enjoying nature and the scenery. I can’t remember if you’ve told me before but have you been to Lewiston to see the Lewis & Clark sites there? We spent a little bit of time in Lewiston on the same trip I blogged about here, and we went on a great Hell’s Canyon trip from there, but I know I have a lot more to see. And on a more recent trip, I went as far west as Spaulding and the great Nez Perce sites there. But I have a lot more to see! Several years back I had the opportunity to work on a very interesting and ancient archaeological site in East Wenatchee, Washington. Coming from Ohio I had never seen such scenery. I knew it was there but still wasn’t ready to see it first hand and drink it in. It was on an awe inspiring level to say the least. It looked to me like giants had tossed their playthings about and left them where they lay. It just so happened that the archaeological site was where it was because of the Scabland Floods and other minor mega-floods, not directly, but nothing happens in a vacuum. I have given several presentations on the East Wenatchee site and can’t begin to talk about the archaeology without stressing the importance of the floods and Columbia Plateau flood basalts of the in the whole scheme of things. Jean Auel visited the site and was more than a little impressed with the dramatic lay of the land. I can only imagine what Lewis and Clark thought of the place. Bill, this is very interesting. Did you get the impression that the Indians had knowledge and understanding of the floods? To me, that was the most extraordinary thing I learned, was that the Indians understood the terrain so much better than dense modern geologists did. The site was about 11,500 years old and pretty much out of the perview modern groups. The site was located up on a deposition bar more than 300 feet above the present day Columbia River. With the glacial melt water the river was probably twice as big as it is now so I guess you could say they were somewhat familiar with the effects of giant floods. The bar was about 6 miles long and 3 miles wide and too big to be a “sand bar”. It wasn’t formed from the Scabland Floods but from a similar occurrence of an ice dam outburst at the confluence of the Snake and Columbia Rivers. The Icelanders refer to these as Jokulhlaups. 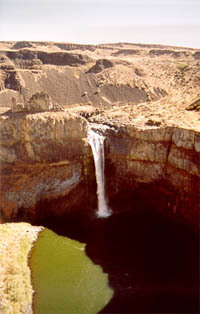 The Columbia Gorge filled with water and discharged when the ice dam gave way and left the deposition bar at the big bend of the Columbia in its wake. The actual archaeological site was a cache of stone and bone tools located in what was a giant flood ripple scar. The Paleo-Americans decided to hunker down there one day and for what ever reason failed to come back to claim their goods. In the big picture it would seem their entire existence there was some how tied to the post glacial floods from availability of stone for tools to protected places to seek refuge. I would think back in that day they were glad to have the resources and really didn’t have time to ponder why. Sounds like another blog. I’m only about 3 behind. Bill, that is really interesting. Thank you so much for sharing all this great information. We have the illusion of permanence, and it is amazing to think about how much the landscape has changed over the years, and how human beings have coped with the changes.